Are you looking for an apartment to rent in Chico, CA, that’s steps away from Chico State? If so, you’ve come to the right place. 7th Street Manor’s one and two bedroom apartments offer comfortable living with convenient layouts. Ranging from 540 to 872 square feet, you’ll enjoy plenty of space to relax in your roomy one or two bedroom apartment. Select apartment homes include a private backyard area, a perfect spot to sip your morning coffee and catch a breath of fresh air. Our cozy homes offer plenty of space to spread out your books for a study session, relax and watch a movie with a roommate, and socialize with friends. An easygoing lifestyle awaits at 7th Street Manor. 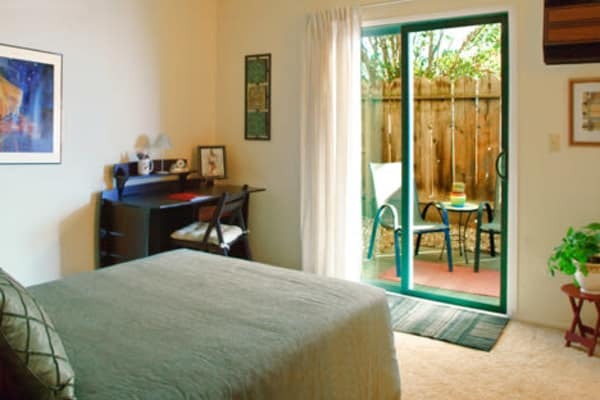 Our friendly Chico community offers the homelike atmosphere you desire. The comfortable floor plans were designed for easy living, with fully equipped kitchens and plenty of closet space. Air conditioning and ceiling fans allow you to maintain your ideal environment so you can feel relaxed and comfortable while you go about your day. Take a look at our floor plans to find the home that’s right for you, then get in touch today to schedule your tour. We look forward to showing you around our community.